Though traditionally snowboarding is thought of as being a winter sport it can actually be practiced almost all year round, if you know where to go. Strictly speaking this isn’t summer snowboarding, but heading to a resort in the southern hemisphere like New Zealand, Australia, Chile or Argentina during the northern hemisphere’s summer, is one way to get a snow fix from June to September. It’s also the most expensive option, but will also give you the best snow conditions. Heading to a summer snowboard camp is a great way to get some snow and sun, and also improve your snowboarding skills. There are now many camps run during the summer, usually on glaciers, which offer freestyle coaching, in the half pipe and terrain park. The choice of locations is large? Norway, Italy, Germany, Russia, Canada, the USA even Iceland all run camps of varying lengths. The coaching comes from professional snowboarders which gives you a great chance to meet and learn from the best in the business. It’s worth knowing that some resorts in the Scandinavia remain open well into the summer. Close to the artic circle, in Norway, Finland and Sweden, you’ll still find the lifts running in May and with almost 24 hours of day light, you’ll have plenty of time to enjoy snowboarding in mild temperatures. Alaska is anther place which retains snow all year round, but it's the home of steep and deep snowboarding, so make sure you’re up to the job. If you just want to snowboard in the sun, head for a glacier as many ski resorts offer lift serviced summer snowboarding there. Although the runs are normally short, it’s still a nice way to get on the snow and keep your skills up during the summer. But don’t think its all sun? It’s not unknown to get powder conditions in mid summer! Not just a summer option, but open all year round, there are an increasingly large number of snow domes and dry slopes that offer a place to practice and learn snowboarding. Snow domes offer real snow in giant indoor freezers and normally have a tow lift. 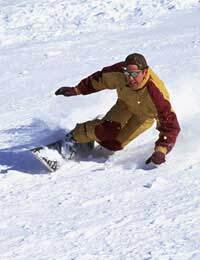 Dry slopes use an artificial surface to mimic snow, allowing you to ride down. Dendix was the original material used and it still exists in many dry ski slopes, but it’s slowly being replaced with the greatly improved Snow Flex material which is safer, faster and has a built in cushion layer. Though most ski resorts close their lifts at the end of April? This doesn’t mean the snow is all gone. Many mountain areas retain large patches of snow on north facing slopes for many months and thus provide an area for the keen snowboarder to get a bit of summer riding. You’ll have to use your leg power to get up there, but the hike is half the fun. Even countries with low mountains like Scotland retain snow for a long time, so grab your back pack and head for the hills.